Terrific ball with tons of back end turn. On a Typical House Shot the ball turns hard and crushes the pocket. Straight out of the box 2000 surface so you will need to play where the oil is. Put a light polish on it and you can attack from any angle on the lane! Perfect benchmark ball for a typical house shot. The solid One Shot 1 coverstock is super clean through the heads especially after adding some polish to smooth everything out. The Spiral- S core will allow you to play multiple angles as this ball has plenty of backend motion to save outside misses, or hold that inside line on tugged shots. I'm a righty standing between 8 & 10 left shooting for around 8 & 10 right at around 15.5 mph and 425 revs. 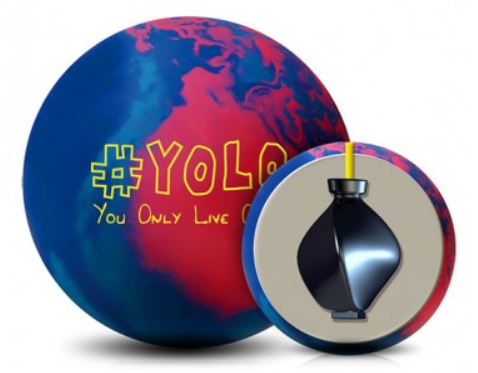 #YOLO so don't miss out on this incredible ball. The YOLO is smooth but strong and continuous . Very versatile ball that will stay in the lineup. Excellent ball but oil is a must. With this unique twisted core you have alot of drilling options. Ball seems to really rev up off the breakpoint. Had this ball a few months and left 2-3 ten pins but I reiterate that you need oil. I really love the YOLO and how much area it gives me. I have mine drilled up to hook pretty evenly and I will say it's kept me out of trouble by not overreacting if I miss a little inside with it. It hits great and it's usable on most shots I've come across. Great Ball! This is an angular ball for a solid. This is a versatile ball, so you can do just about anything you like. This is my go to ball on most shots, and it gives me an idea how to line up with the rest of my equipment! By far, this is my favorite. The YOLO is the most versatile ball I have ever rolled. Being left handed, this ball creates area and break points that I typically don't have. A must have ball.